Mari Abraham integrates her shamanic work with the practice of Intimacy Education. 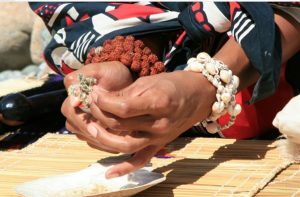 In this unique workshop, she invites us to make nature and ancestors authentic and powerful resources in our healing and wholing. *Amadlozi – Zulu. The closest English translation to this word is ‘Ancestors’. The Amadlozi include bloodline relatives of past life/present life/future life- not limited to Human genetics, All Beings and Spirits of: Nature, the Planets, the Cosmic Systems, Ascended Beings, Star Nations, Parallel Universes and all energies of all creations in all directions and dimensions throughout all times and spaces, beyond…. Ceremonies may include fire, water, mud/clay, plant medicine (non-hallucinogenic/non-purgative), drumming, dancing, masking…etc. This will depend on what the organic energy of our collective creates together! Mari Abraham is a Sangoma – a traditional Zulu shamanic practitioner. Blending her academic, cultural and shamanic training, she is able to bridge spiritual viewpoints, knowledge and ancient wisdom in authentic and meaningful ways. As a practitioner of the old and new ways combined, it is important for her to remain dedicated to the power of Unconditional Love and the Source from which it comes. Her role is to assist in the empowerment and embodiment of the potential for greatness in all Beings and promote a new global culture of peace and unconditional love.